Starting a cleaning business is like learning to drive on a stick shift. You might be able to get the car out of the driveway in reverse, but have you checked the gas gauge? You have to learn to take in the details but still keep the big picture in mind. 2. Not fliering or not fliering enough. 3. Not setting up a "professional" website. 4. Not practicing giving estimates. 5. Not taking notes for each job. 6. Not treating it like a full-time job from your very first day. 8. Not improving! Work on both your cleaning & your interpersonal skills. # 1 - Tell everyone. Once you have taken the steps toward building your new cleaning business, don't keep it a secret. Begin by sharing your news with everybody you know. Your friends and your spouse, your mom, your dad and all your aunts and cousins. People are always happy to hear about a new enterprise. Send out an e-mail to key people in your circle of friends, such as your buddy who coaches soccer, your minister, or your college friends who are born leaders, and ask them to spread the news in their groups. Remember to use the six degrees of separation. In other words, use good, old-fashioned grassroots social networking to get the word out. #2 - Flier every day. Distribute fliers each day. If you don't have a daytime job, go out for 4 hours each day and flier for your new cleaning business. Just put one foot in front of the other and grow your business step-by-step. Working during the day? Flier for one hour in the evening after work. Granted, fliering is not everyone's favorite thing to do. However, it works so well and gets good results so quickly that it is almost a guaranteed use of your time. When your phone starts ringing and traffic starts coming in to your cleaning business website, you'll know your efforts at hitting the sidewalk are paying off. Aside from growing your business quickly, fliering has a special bonus. You will feel good after getting some exercise. In addition, you'll learn the lay of the land in the neighborhoods where you want to work. Suze & Ev have done this (oh yes, for many hours! ), and we swear by this basic advertising method. It really works. #3 - Use your Cleaning Business Website. Your website is advertising your cleaning business 24/7, regardless of whether you are working, sleeping or goofing off. Maximize your website's capabilities. Begin by doing the above (fliering), being sure to prominently include your website address. 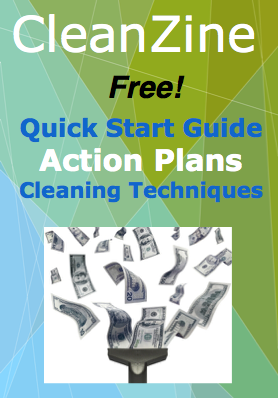 Make it easy for people who pick up your flier to check out your cleaning business online. Offer special coupons and cleaning tips on your website to engage people and give them useful information. When someone contacts you via your website, be sure to respond promptly and courteously. Give them a reason to remember and hire you. Never forget how powerful word-of-mouth advertising is, and how fast it can travel online. #4 - Practice giving estimates. Just as in sports and music and every other learning process, practice makes perfect. Practice giving estimates for your cleaning jobs and you will improve your skills quickly. Practice role-playing at a family member's house, or over at a friend's. Knock on their front door (or ring the bell), introduce yourself and allow them to invite you into their home or place of business. Ask them questions about their needs and take notes when they answer. Jot down your impressions of the state of their rooms. To yourself, note things such as, how much furniture in each room (dusting adds time)? How cluttered is the space? Are there antiques or other items that must be treated with special care? One woman who Suze cleaned house for had two grand pianos in her living room. And she owned an extensive antique glass bottle collection. Be prepared. Everyone you do an estimate for is different, and their "stuff" varies greatly. Keep your eyes open and practice. Practice giving estimates so you will be more comfortable and self-confident, and you'll get more jobs sooner. Take your notebook, your Daytimer, your iPhone, BlackBerry or Android (OK, whatever you've got!) to every estimate you give, and every job you're on. You may think that you'll remember when Ms. Anderson asks you to arrive one hour early next time and clean the stove and fridge. But you are busy. Don't make yourself crazy and don't take the risk of disappointing your clients (and losing them). Take notes instead. Make this a habit, a part of your system. Systems are only really helpful when they are applied. It doesn't matter what type of system you use, just establish one that works and stick to it. That way, you won't lose business and you won't waste time trying to remember what you told Mrs. So-and-So. #6 - Treat it like a full-time job. There's nothing that satisfies quite the same as bringing home the money, especially when you know that you have worked hard to earn it. Starting a cleaning business is just like any business in the early stages. You have to put in effort to get the results you want. Our methods work, and we're living proof. We're also very excited to show you how to get where you want to be, business-wise. However, no one but you can decide how motivated you are. Treat your new business with respect. Put in the time and give it the effort it needs to get rolling in the early days. Soon, you'll be looking back and realizing that YOU are the one that made it all happen. It's a fabulous feeling. Treat your new business like a full-time job from the get-go. Put in 8-hour days and stay with it until you reach your goals. Believe us, you will be able to relax into the job, and yes, even coast at it, eventually. But first, you must learn and internalize all your new skills and experiences, until they become second nature. #7 - Have realistic expectations. Your cleaning business will take some time and effort to get rolling. You already know this. Just keep your eye on your goals, and follow our steps. You will get results from fliering and from other advertising tools, such as your business website, but you might have to be patient at first. You are growing a worthwhile business, and it must go through stages of development. Bear in mind, people who are in need of a cleaning service often have your flier for months or even years (yes! It happened to us) before they decide to call you. Not everyone, mind you. Some people will call you immediately, while others are cogitators who will put your flier up on their bulletin board and think about it for awhile, then give you a call. Your marketing efforts will bear fruit in both long-term and short-term scenarios. #8 - Practice your 'people skills' and cleaning skills too! Do you feel comfortable just talking to people? I mean in a casual sort of way, such as, "Hey there, how about those Dodgers?" Chances are, you possess a modicum of fair to excellent people skills already. By "people skills" I'm talking about good-natured and direct communication. People hiring a cleaning pro are usually looking for someone who they sense can do the work well, be trustworthy, and be easy to communicate with. Brush up on your people skills if you think they're a little rusty. It's fun, actually! When you have your own cleaning business you will meet some really smart and amazing, interesting characters. Some people are just naturals at being efficient, both time-wise and in their actions. Believe me, I thought I was pretty efficient until I went out on my first job with Ev. He pointed out that if I spent that much time detailing the kitchen I might never get to the bathrooms. So do what I did. Get your supplies out at home (or at a friend's -- you will not have trouble finding volunteers to help out with this!). Set a timer, and get cracking. Challenge yourself to include deep-cleaning too, and you will get a more realistic sense of what it takes you to complete a satisfactory job. Plus, you (or your lucky friend) will get a clean house out of the deal.